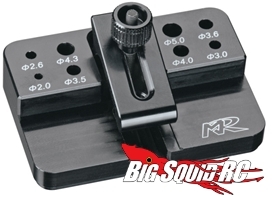 Muchmore Soldering Station « Big Squid RC – RC Car and Truck News, Reviews, Videos, and More! Soldering can really be a pain sometimes… Luckily, Muchmore Racing has a sweet new Soldering Station to help you out. It is like having a third hand. Eight different-sized holes to help hold connectors, a clamp to hold an ESC or connector in place, and it’s small so it doesn’t take up much room at all. Best of all, it can be had for $40 right now! Make sure you check out Muchmore USA for more info!